We offer PAT testing for all types of businesses in Basildon, South Benfleet, Grays, Stanford-le-Hope and anywhere else in Essex. This would include: offices, schools, local government and council premises, factories, retail premises, care homes, nightclubs, hotels, public houses, shops including hair salons, beauty salons as well as local authority premises. Ensuring that your business complies with the most current and up-to-date Health and Safety legislation as well as the insurance requirements for employee and public liability. If you have a business in East London, Essex or Kent, then we can offer you our PAT Testing services too. Minor faults are fixed and retested immediately. If you have already got a quote, then please can you inform us and make us aware who the quote was from and how much it was and we will do our very best to match it and probably improve on it. If you have already got a quote from another electrician, then please let us know which company they are from and how much they quoted you and we will do our very best to match it or we may even be able to beat it. If you have been comparing quotes, remember that the final quote you get from us will be the price you pay. We can promise you that there will be no extra or hidden charges for rewiring plugs or for changing fuses, additionally for pat testing services that are carried out within Essex and East London. We do not charge for the extra mileage. Your PAT testing will be carried out by our own City and Guilds qualified, fully trained PAT testing engineers in accordance with the codes of practice for testing and service inspection of electrical appliances that are portable. We will never sub-contract out this work to another electrical company as we do all the work ourselves. You will find that our PAT testing service is of the highest standard. We offer nothing but a first class service carried out by honest and reliable electricians. Our prices are very reasonable compared to other local companies. The portable appliance is checked over visually to ensure that it is not damaged in any way. We will then ensure that the electrical flex has no signs of damage either. 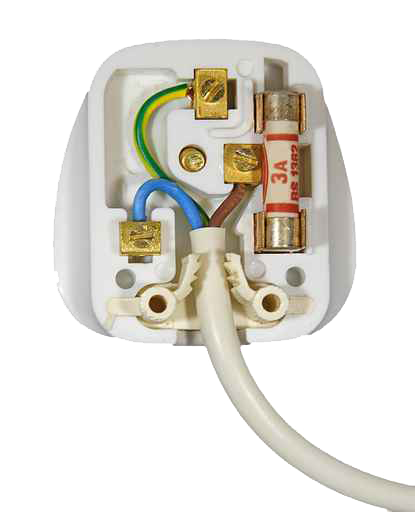 The plug is looked at and examined ensuring the flex is correctly and safely secured to it. It is then opened up so we can check the fuse is correctly rated for the appliance and the wiring has been done correctly. Finally, we check for overheating and damage/splits on the plug's plastic casing. This test is used to test Class I & II appliances. We will use a 500v DC current that is passed to the electrical appliances to measure the resistance which should be within the ranges of 1.0 Mohm for Class I appliances and 2.0Mohm for Class II appliances. The Earth Bond test is carried out only for class 1 appliances to check that they are earthed correctly. A gentler version of insulation resistance testing, used on appliances with voltage limiting devices. Used to measure protective conductor current between earth and live parts in class I appliances or from live parts to the appliance enclosure for Class II appliances.